WASHINGTON, DC -- Green Party leaders and candidates responded to the 2013 United Nations Climate Change Conference in Warsaw, which concluded on Friday, Nov. 22. During the meeting, which is also called Conference of the Parties (COP 19), two walkouts took place in protest of the behavior of delegates from wealthy nations: (1) 132 developing countries walked out during talks about compensation for 'loss and damage' because of climate change, claiming sabotage by developed nations; (2) the International Trade Union Confederation, World Wide Fund for Nature, Oxfam, ActionAid, Friends of the Earth, and Greenpeace walked out on the last day. Greens expressed special concern over a leaked U.S. internal briefing paper instructing negotiators to oppose a time line regarding funding for climate-change adaptation in poor nations and to delay emission-reduction commitments (http://www.popularresistance.org/leaked-documents-us-opposes-helping-poor-countries-re-climate-change/). • Wes Rolley, past co-chair of the Green Party's EcoAction Committee (http://www.gp.org/committees/ecoaction/index.php): "When the final global climate change agreement is ratified in 2015 at the Paris Conference, the goal must include deep economic reforms that meet the needs of all the Earth's people while phasing out all fossil fuels. The breakdown in talks at COP 19 last week leads us to fear that the U.S. and other industrial nations will only tolerate steps that don't interfere with the investments of the One Percent or block high-consumption domestic growth. The well-being of billions of people around the world must take precedence over corporate bottom lines and intellectual property rights, or we'll see a massive breakdown in global security in the coming decades. 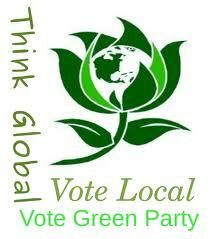 Greens understand this. Democrats and Republicans apparently don't." • Darryl! L.C. 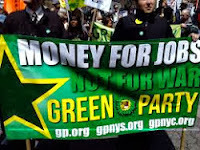 Moch, co-chair of the Green Party of the United States: "The U.S. and other wealthy nations must make good on the pledge made at the 2009 Copenhagen meeting of $100 billion for poorer countries that seek to lift their populations out of poverty and prevent projected environmental catastrophes. Wealthy nations owe much of their prosperity to decades of high fossil-fuel consumption and to resources and labor taken from poorer nations. Unfortunately, only $7.5 million has been committed to this fund as of June 2013. To put the pledge into perspective, remember that the White House and Congress guaranteed over $7 trillion in TARP bailout funds after the recent economic meltdown. Is saving Wall Street more important than saving the world?" either elect candidates who will enact the Green New Deal or something very much like it, or keep electing Democratic and Republican politicians loyal to Big Oil, Wall Street, and other top corporations responsible for global warming. 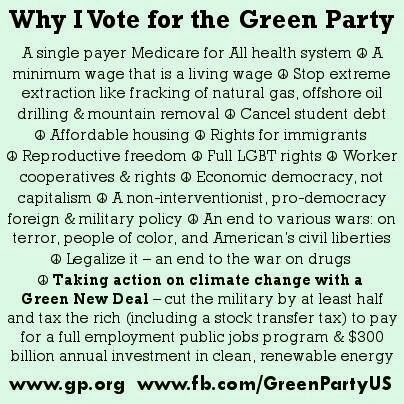 That's why we call the Green Party an imperative for the 21st century." "Global Greens React to Ongoing COP 19 Negotiations"
"Corporate lobbyists flood Warsaw Climate Talks"
"Just 90 companies caused two-thirds of man-made global warming emissions: Chevron, Exxon and BP among companies most responsible for climate change since dawn of industrial age, figures show"